Have you ever seen the Amazing Acro-Cats? 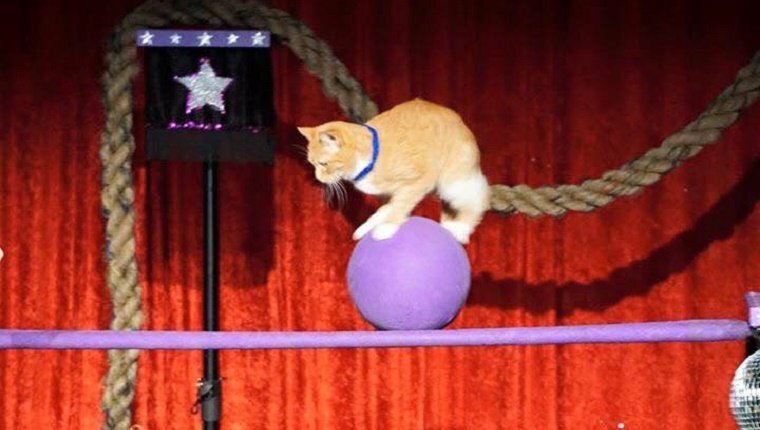 They’re a team of about 15 trained cats who perform to sold-out venues across the United States. The purpose of their show is to promote cat training awareness and feline adoption. These hour-long cat performances are like nothing you’ve ever seen. These cats have a lot of tricks up their paws! 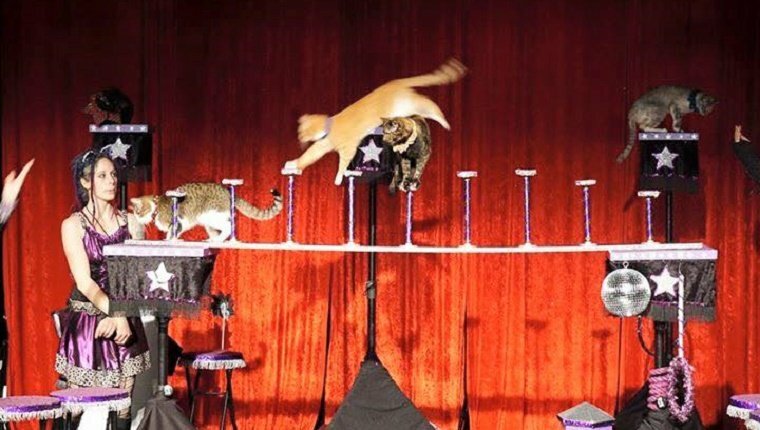 The Amazing Acro-Cats run through obstacle courses, hoist flags up poles, jump through hoops on command, and even play instruments! Of course, cats are unpredictable and they don’t always do what they’re supposed to. That’s part of the charm. As you can see in the video above from when they appeared on The Late Show With Stephen Colbert, these cats don’t always want to get out of their carrier. And sometimes they’ll have a completely different destination in mind when they do! But everyone takes the whole thing in stride and it’s a lot of fun. Each cat in the show is a rescued cat. For example, Asti was an orphaned barn kitten who was bottle-raised by Samantha Martin, the founder and trainer of the Acro-Cats. The star of the show is Tuna, who leads the “Rock Cats” band that ends every show. Tuna, a soft, white cat, is the original Acro-Cat. Samantha adopted Tuna after she was born to an abandoned neighborhood cat. Soon, Samantha realized that Tuna had a special talent for ringing bells, and the rest is history! The Acro-Cats are a super fun group to watch, and you should definitely think about seeing them if they are coming to your city soon. But you can take a little of their magic and bring it home. You may not realize it, but you can train your own cats using clicker training techniques similar to Samantha’s. Read more about clicker training on CatTime’s article here. Have you seen the Acro-Cats? Have you trained your own cats? Let us know in the comments below.